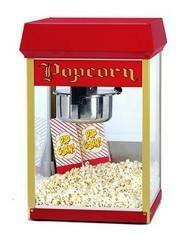 Add a popcorn machine to your party. Whether it is an outdoor movie night, birthday party, baseball game, school picnic, carnival or corporate party this large 8oz commercial popcorn machine is sure to be a hit. Included in this price is popcorn bags and premeasured popcorn, butter & seasoning packets for up to 60 people. Add 60 more servings for $15!